PS: I’m away for a couple of weeks. Mrs Bugle may post if you’re lucky. Sorry for long posting but I thought local residents may want to know what is going on. The Blackwall Tunnel northbound will remain closed until Wednesday at the earliest after a vehicle fire in the tunnel damaged the road surface, lighting and CCTV systems. · DLR and London Underground are accepting bus tickets due to a number of bus diversions in the area. The fire, involving a people carrier, happened at around 17.45 on Sunday 29 November 100 metres from the tunnel exit. Emergency services attended and the fire was quickly extinguished. Garrett Emmerson, Chief Operating Officer, London Streets said: “We are working flat out to repair the damage caused by the fire as quickly as possible and have taken a number of steps to try and mitigate the disruption and frustration this has caused. Motorists approaching from the east can now use Blackfriars, Southwark and London Bridges without paying the Congestion Charge and bus passengers will be able to use their tickets on the Tube and DLR. DLR services are available from Greenwich and Cutty Sark stations south of the Thames and Blackwall DLR station north of the Thames. Jubilee line services operate from North Greenwich station with connections to the DLR from Canning Town. Some bus routes are on diversion and London Underground and the DLR will be accepting tickets from customers travelling in the area. 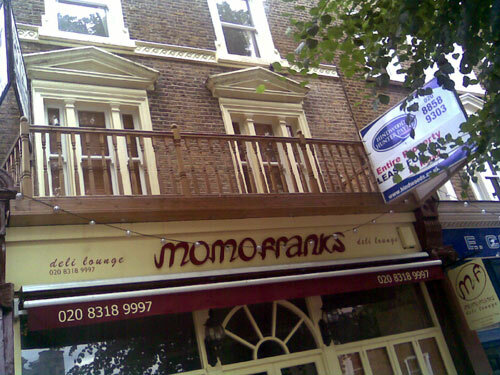 I noticed that Momo Franks was being redecorated today – I asked one of the builders what it was turning into. He said that the wedding shop down the road is moving in. I’m guessing that it is this one. Now, I know what you’re thinking – how useful is a wedding dress shop… You’re (hopefully) only going to need one per lifetime. But I think it will be a nice shop I think. Why? PS: Moving house this weekend – staying in Blackheath. All I can see is cardboard boxes. Amazing photos of “The Blackheath Cavern” on the Subterranean Greenwich and Kent blog. Also known as Jack Cade’s Cavern, these are photos that I haven’t seen before! Well worth a look. Imagine the parties down there. I wondered if you might be interested in putting something on your site about a fund raising evening I am organising for the Cystic Fibrosis Trust. 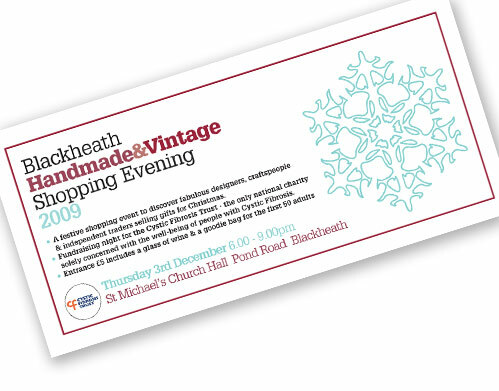 The event is the Blackheath Handmade & Vintage Shopping Evening on 3rd December. There will be local designers and craftspeople, and independent traders to selling gifts for Christmas. It is going to be held in St Michael’s Church Hall, Pond Road. It’s from 6-9pm and entrance is £5. Not the first time vintage clothes have appeared on this blog! There were at least two windmills on or close to the Heath in the late 17th century: one close to the fence of Hollyheadge House, on the Heath towards Dartmouth Place, and another on Morden Hill. Windmills were big business in the 18th century. A mill owner needed to be a rich man because the cost of construction was considerable. But once the investment was made the potential earning power was equally considerable. The owner might live well but the operator would have been a relatively menial character, suffering the dust and dangers that milling created, especially at the peak milling period after harvest. By 1770 Hollyhedge House, in the Dartmouth freehold, had been re-leased to Charles Newton and by then the mill had been pulled down. But there was still enough work for more than one windmill. The river Ravensbourne had sufficient speed of current to drive a number of grinding wheels but the farms of Kidbrooke and Lee, as well as the local demand for cattle and horse feed, would have been more than sufficient to keep a host of millers busy. Further, the Heath was an ideal site for a windmill, with wide sweeps of high open land which would allow the mill sails to catch even a slight breeze. If it were possible to design a modern wind turbine that had all the rustic charm that we now associate with windmills (even though at the time, they were just another piece of agricultural machinery), perhaps it would be possible to harness the considerable might of the “heritage” mentality into the green cause. Unfortunately, mills require high torque, low power, which means lots of sails, whereas electricity generation requires high power low torque (three fins). As several people have pointed out, Greenwich Council are offering half a million pounds to five projects, including the Transition Westcombe Project. Now they have to decide how to bid for the money. 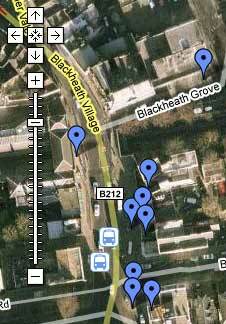 I’m still not exactly sure how the Westcombe Park area is defined, but a good chunk of it seems to be Blackheath, so if you live nearby, why not suggest a few ideas. My suggestion would be wind. Blackheath has a spectacular wind resource up on the heath. The problem would be how to use it without upsetting everyone. The climate camp really opened my eyes to how much wind was up there, and as frequent readers will know, I spent quite a bit of time up there, finding out what was going on. The group who set up the wind turbines during the climate camp were called V3 Power, and whilst chatting to them, I learnt that they often hold workshops, to teach others how to build wind turbines. I wrote a transcription of the talk they gave during the climate camp. So I emailed them, and weeks later I received a message saying that they would be holding a Wind Turbine Workshop over a weekend in Shropshire, asking if I’d be interested. Now, I figured that my craft skills pretty much ended aged 14 in a CDT class breaking a jigsaw on some MDF – not exactly impressive stuff. We never seemed to do anything more exciting than trying to build a clock at school. So this was well beyond anything I had any natural adaptation for. Windows Icon Mouse Pointer, yes. Angle Grinder, Set Square, Welder, Draw Knife, no. But, I figured it would be interesting, and it’s always good to try new things. Plus it had the backing of Mrs Bugle. So off I went. The course was great – I’d recommend it to anyone who’s interested in these things – it couldn’t have been more hands on, met some lovely people, and the constant patience and enthusiasm of all involved was totally uplifting. There are loads of videos here, in no particular order. Anyway, I think it’s a great idea – it’s a great skill to have. So if Transition Westcombe find themselves richer to the tune of half a million, I’d suggest some windmills on the heath. They were there in the past – they could come back again.